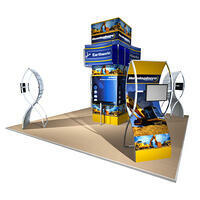 Portable, easy to set up exhibit that goes that achieves a custom look without a custom budget. Gridline is created with a square aluminum extrusion with a single size profile. 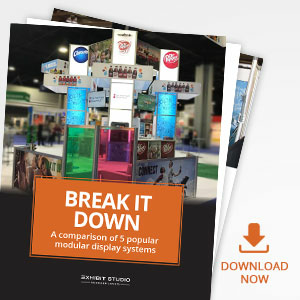 It is a lighter system than Octanorm but not as versatile. Horizontal & vertical sections are connected by a plastic hub, and graphics are held in place by magnetic tape. This is the easiest system to use if only one person is available for set up and take down. Gridline is a tool-free setup. The straight and curved extrusions are finished with a cross-shaped end cap that fits perfectly into the square plastic connector and twists 45° to lock in place. 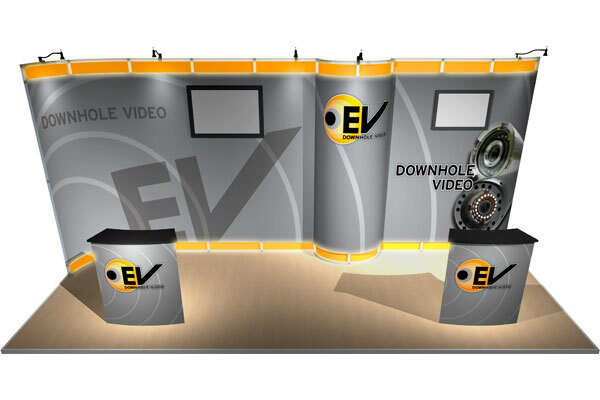 Assembly is a simple matter of twisting horizontal and vertical beams into the connectors and attaching your graphics and lights. Gridline graphics are printed in-house to a white polyester film, and our carefully chosen face laminate is textured—reduces glare without dulling the graphics—ensuring our graphics are rich & vibrant. An 11mil light-blocking back laminate reduces any visible shadowing, and the panels attach magnetically to the Gridline hardware. 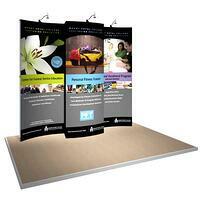 These rollable graphics make setup easy, and shipping simple and compact. 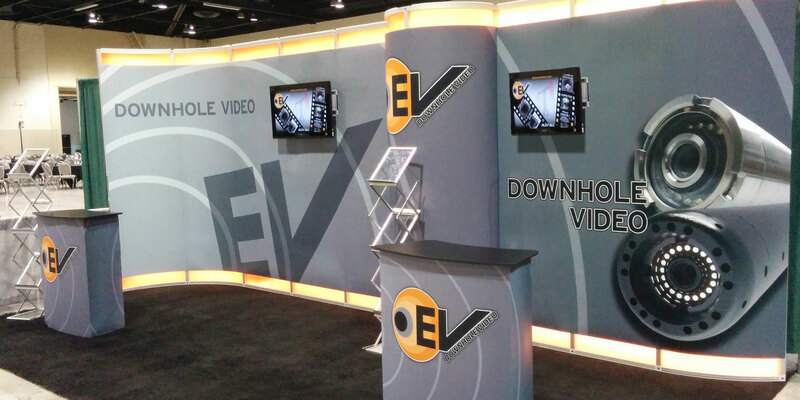 Many of our standard Gridline configurations, designed to fit into a 10′ x 10′ booth space, pack into a single oval shipping case and can include a graphic and laminate top to convert the case into a podium. 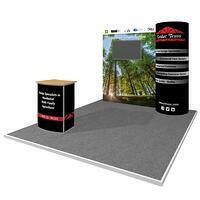 Of course, you can always go with a matching Gridline Podium for an option that includes shelf space! 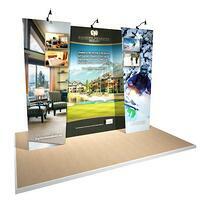 Any style, size and shape of display you have in mind can be designed and built from Gridline. Sit down with our designers and plan out what you need and what you want. 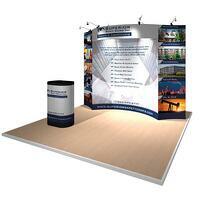 We’ll provide 3D concepts so we can work together to plan and build the perfect display for your company. With many different Gridline configurations already designed, it’s easy to start with an existing layout, adjust the hardware to suit your needs, and customize your graphics and colours. Check out the gallery to get started! Gridline may be the display option for you! I have dealt with Exhibit Studio for quite some time and Shayla has always been one of the main reasons why I have remained loyal to this business. She is innovative, decisive and very professional in all manners. I really think that one of her strong suits is knowing what will draw a customer in without going too far and making the design gaudy. Shayla has always been on time, on budget and on the mark providing an innovative style with the classic endurance that I really appreciate. 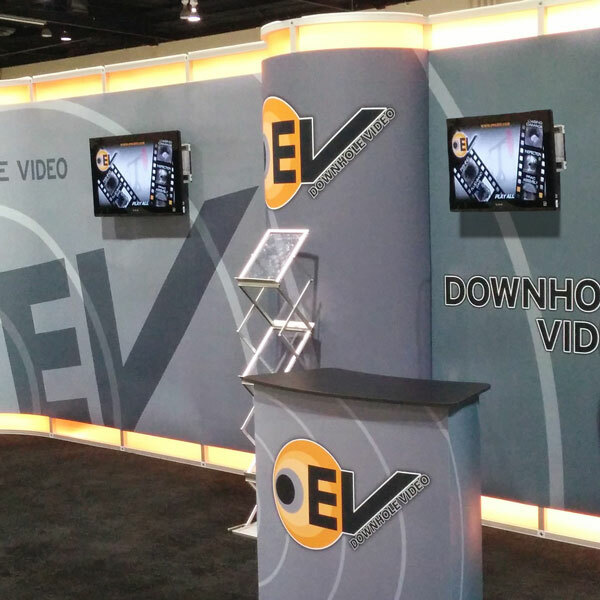 Shayla has built over four booths for us—10 x 10, (2) 10 x 20, 20 x 20—and we have always found that our booths stand out, are spacious for customers to feel comfortable and in general present our image to the customer about who we are. Curtis Jerrom, VP Canada, EV Canada Inc.